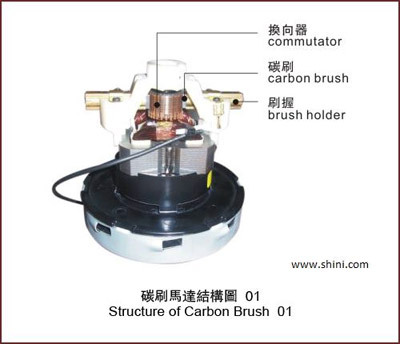 Carbon brush motor is widely used in many equipments including double-current generator, synchro motor, electric welder and it is also can be seen in electric toy, electric shaver and electric bicycle. 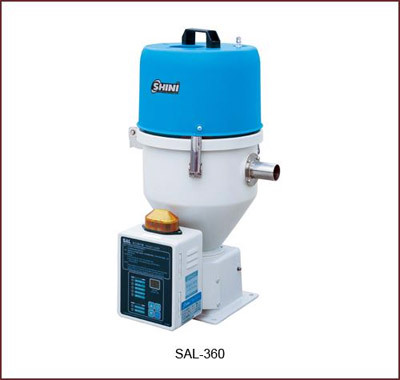 Both Shini self-contained loaders SAL-330/360 series and SAL-U adopt carbon brush motors due to its high rotation speed, compact size and strong loading capacity. A preventative and periodical maintenance schedule is essential to ensure a long term stable motor running. The periodical inspection not only lowers maintenance costs but maintain a sound motor operation state. Below Table 1 is designed for a motor periodical maintenance schedule and users can make their exclusive plans based on actual operations. • Make sure carbon brush flap is in fastening and the flap does not affect movement of carbon brush. • Make sure carbon brush flap not contact with non-insulated parts inside motor. 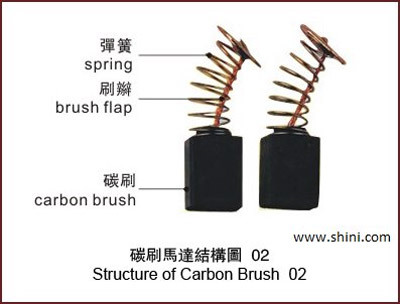 • Check if carbon brush can move freely inside brush holder, the spring position should be correct and works normally. • The distance between brush holder and commutator surface should be consistent. • Check carbon brush length; replace it when abrasion length exceeds two thirds of total length. • Pay specific attention to the carbon brush replacement. Brushes used in the same machine should be consistent. • Track motor operation state before and after adjustment and replacement. • Carbon brush after replace should fit the curve on commutator surface. • Cleanup on the surface. It is supposed to use dry and pure compressed air to clean. Do not use liquid solvent, which will cause surface erosion. And avoid using industrial spirit. • If commutator is polluted by sewages, voltage between segments will act on the sewage. Then current compounds problem with overheat and burn, finally wires are easy to break and inner parts will breakdown. Users must replace device once sewage is found burning inside commutator. • The slight strip and groove on the commutator are made via grinding and polishing. Clean coarse cloth can be used to wipe commutator to maintain oxide film. If the comumutator surface is too rough with deep strip, groove scratch, loud noise when commutating or increased brush abrasion, it is necessary to make turning on the device.